Loosened Tooth. May bleed a little from the gums. Usually tightens up on its own. Displaced Tooth. Usually pushed inward. Needs to be seen. Chipped Tooth. Minor fracture with small corner of tooth missing tooth. The fracture goes to the dentin (yellow color), not the pulp (red color). Not painful. See dentist during office hours. Fractured Tooth. The fracture goes down to the pulp. The pulp is where the blood supply and nerves to the tooth are located. The main finding is a red dot or bleeding in the center of the tooth. Very painful. Needs a root canal to save the tooth. Knocked-Out Permanent Tooth. Also called an avulsed tooth. A dental emergency. Needs to be re-implanted within 2 hours. Knocked-Out Baby Tooth. It cannot be re-implanted. See during dental office hours. The main symptom is pain. Minor bleeding from the gums may occur. For pain, put a piece of ice or a popsicle on the injured gum. You can also use a cold pack on the cheek. For any loose teeth, offer a soft diet. Avoid foods that need much chewing. You can go back to a normal diet after 3 days. By then, the tooth should be tightened up. Tooth pain most often goes away in 2 or 3 days. Rinse off the tooth with saliva or water (do not scrub it). Replace the tooth into the socket, facing the correct way. Press down on the tooth with your thumb. Do this until the crown is level with the tooth next to it. Have your child bite down on a wad of cloth. This will help to keep the tooth in place until you can reach your dentist. Note: Baby teeth can't be re-implanted. It is very important to keep the tooth moist. Do not let it dry out. Transport the tooth in milk or saliva. Milk is best. Milk Transport Option 1 (best). Place the tooth in a small plastic bag with some milk. Put the plastic bag in a cup of ice. Milk Transport Option 2. 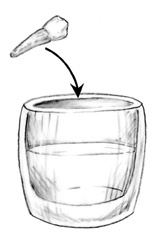 Place the tooth in a cup of cold milk. Saliva Transport Option 1 - for Child 12 Years or Older. Put the tooth inside the child's mouth. Be careful not to swallow it. Saliva Transport Option 2. Put the tooth in a cup. Keep the tooth moist with child's saliva (spit).